In early February 2017 a conservation officer in southeastern British Columbia came across an adult female bighorn sheep (Ovis canadensis). She appeared lethargic and ill. Not wanting to disturb her unnecessarily the conservation officer left, and returned over 4 hours later to find her bedded in the same position – not normal behaviour for a bighorn sheep. As the conservation officer approached the animal took a few slow steps, but seemed lethargic and dull and he noticed that the lips and nose appeared quite unusual. They were extremely large and crusty (see images below). The conservation officer euthanized the animal and performed a post-mortem examination in the field noting that the animal was emaciated with no indications of trauma. 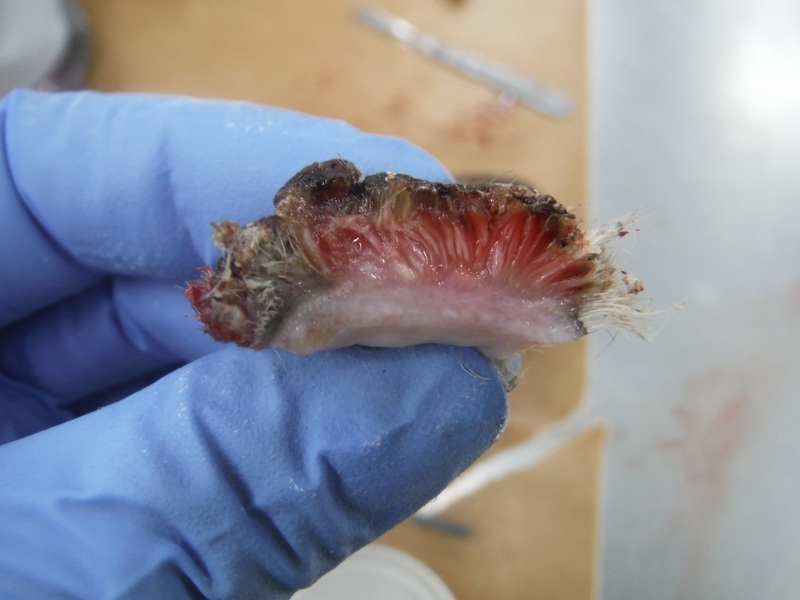 The head was sent to the Animal Health Centre, the BC node of the Canadian Wildlife Health Cooperative, for further investigation of the mouth lesions. 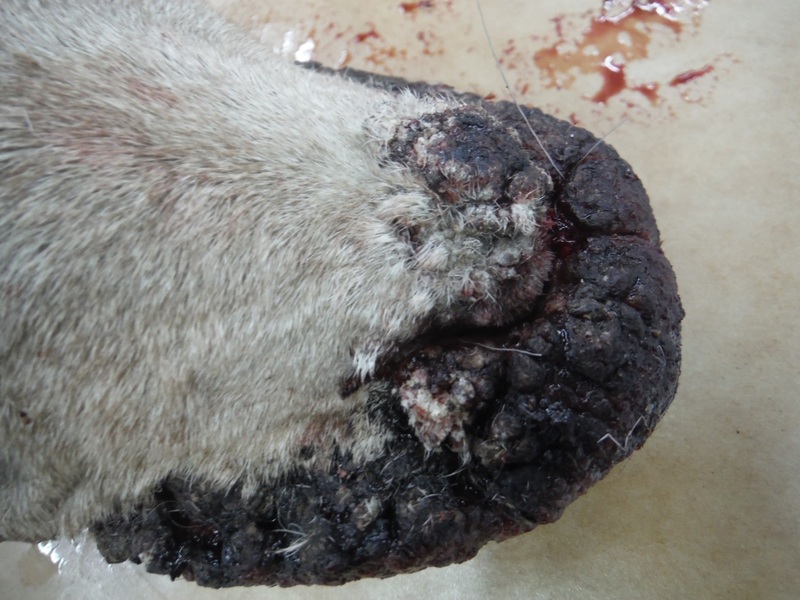 Based on the characteristic gross and microscopic lesions, a positive PCR for ovine Parapoxvirus and the visualization of Parapoxvirus particles on electron microscopy, the animal was diagnosed with Contagious Ecthyma, more commonly known as “orf” or “sore mouth”. Contagious Ecthyma is a common disease of domestic sheep and goats caused by ovine Parapoxvirus. It has been reported sporadically in bighorn sheep in BC and Alberta since the 1950s. It typically affects lambs, but can also affect adults, as in this case. It is spread by direct contact or fomites (materials that may carry infectious disease). In bighorn sheep regular use of salt blocks may lead to increased rates of transmission. 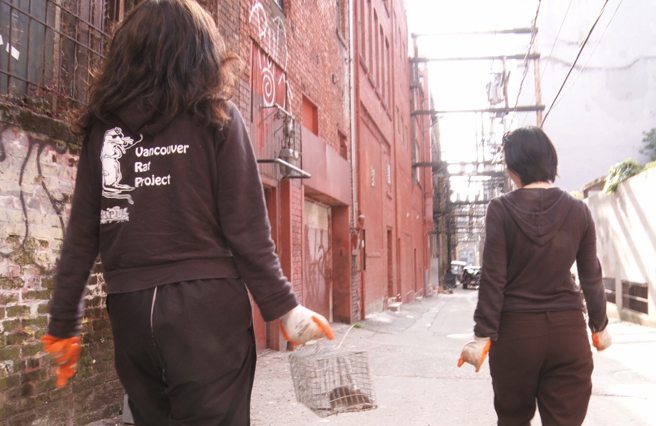 Most infected animals will recover in 3-6 weeks, but it can affect food intake. In this case it seems likely that the severe mouth lesions would have negatively affected feed intake and at least contributed to the poor body condition. However, we don’t know if this was the sole cause of the emaciation and ill-health of this animal or if other concurrent factors also contributed. Bighorn sheep with crusting and proliferation of the nose and lips due to Contagious Ecthyma. 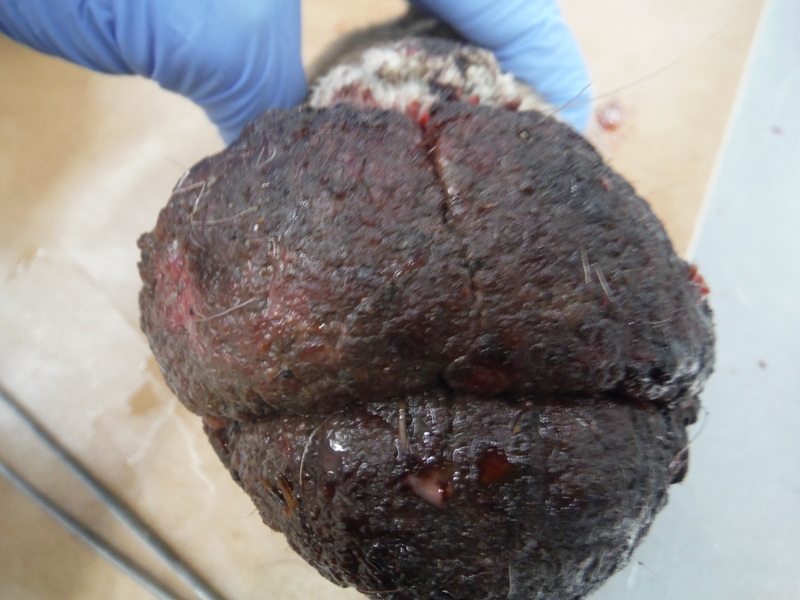 Front-view of the lips of a bighorn sheep with severe proliferation and crusting of the lips from infection with Ovine Parapoxvirus (causes Contagious Ecthyma). Cross-section of the skin of the lips of a bighorn with severe Contagious Ecthyma. 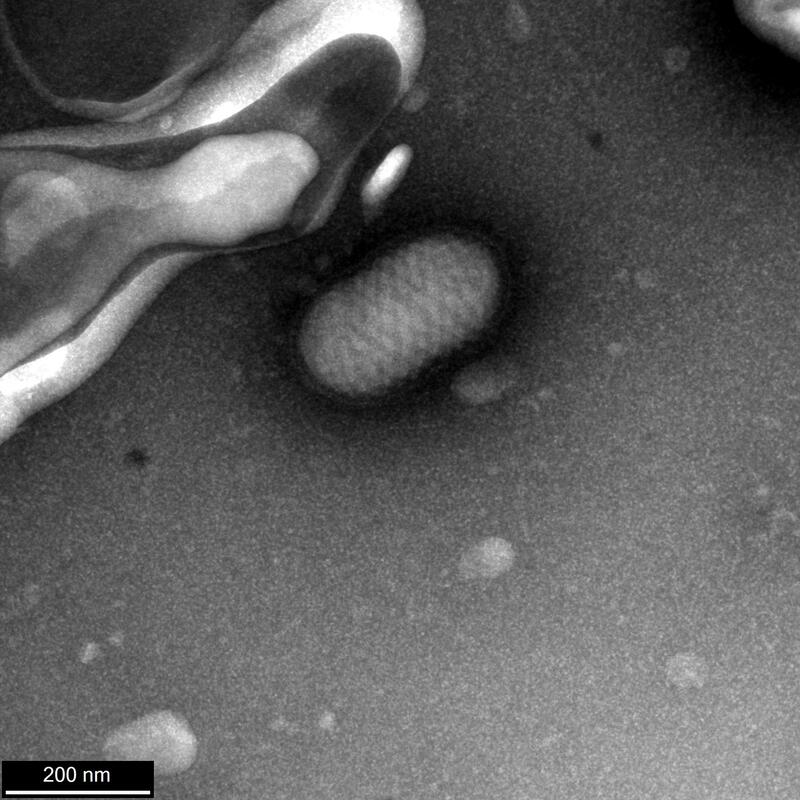 Electron micrograph of a Parapoxvirus.